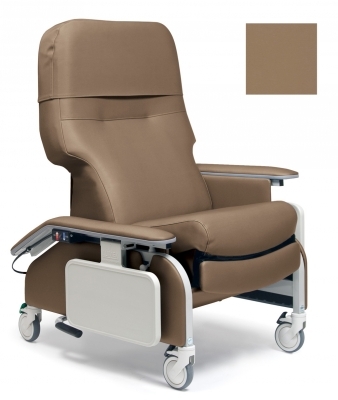 The Deluxe Clinical Care Recliner sets a new standard of comfort for the patient and ease of use for the caregiver. The Series FR566G and FR566GH Deluxe Clinical Care Recliners feature three positions for patient comfort. The fourth position is a Trendelenburg (or Shock Position) that must be activated by a caregiver. The Trendelenburg Position cannot be activated by a patient while in the recliner. The wide, contoured seat and back, along with an integrated footrest, provide an enhanced level of comfort. Built-in arm pads in the back give improved suppt for the arms. Wall saver armrest caps increase durability of the armrests and protect walls from marring. Higher floor to back height enables the caregiver to raise the patient up with less effort, reducing the chance for a back injury. Extra deep Trendelenburg Position is easily actuated from either side of recliner by a conveniently located foot pedal. 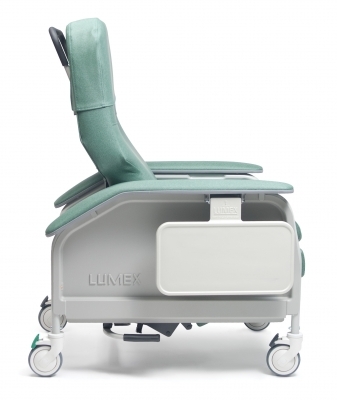 Steeper angle helps improve patient stabilization. 350 lb maximum weight capacity, EVENLY DISTRIBUTED.